In this post, I’ll show you step by step through using the Aion Token Transfer Bridge with Ledger Nano S hardware wallet. This will be particularly helpful for those who are currently holding their AION ERC-20 Tokens on a Ledger Device. You can follow along with the video, or perform the steps listed below. First, check that the firmware on your Ledger is up to date. 1. Insert the USB cable to switch on the device. 2. Enter your PIN code to unlock the device. 3. Press the right button to select to the settings menu and press both buttons to enter. 4. Navigate to Settings > Device > Firmware. 5. The firmware version is displayed under Secure Element. Now let’s install Ledger Live, update the Ledger firmware, and install the Aion Coin app onto it. 1. Download and install Ledger Live. 2. Open Ledger Live and select Manager. 3. Plug in your Ledger with the USB cable, and unlock it by entering your pin. 4. If asked, allow the manager on your device. 6. Click Install. Your Ledger will display “Processing…” , and then a confirmation once the installation is complete. Instructions to download the Aion Coin app onto Ledger Nano here. If your Ledger device firmware is already updated to version 1.4.2, skip the firmware update and go straight to adding the Aion Coin App, by searching for it in Leger Live’s App Catalog. 1. Download the Aion Desktop Wallet. 2. Installation steps for each operating system are pretty standard. If you get stuck, check out the Aion documentation. Now with the firmware updated, Aion Coin App installed and Aion Desktop Wallet installed, we can proceed to use the Aion Token Bridge to perform the swap. The first step is connecting the Ledger device with the Aion Desktop Wallet. 1. Connect and unlock your Ledger device. 2. Open the Aion app on your Ledger. 3. Navigate to Settings within the Aion app on your device and check that Contract data is set to Yes. 4. Open the Aion Desktop Wallet. 6. Select Ledger and click Connect to Ledger. You need to have the Aion Coin App open on your Ledger when you connect. This means on the Ledger Device you need to open the Aion App, then try to connect. 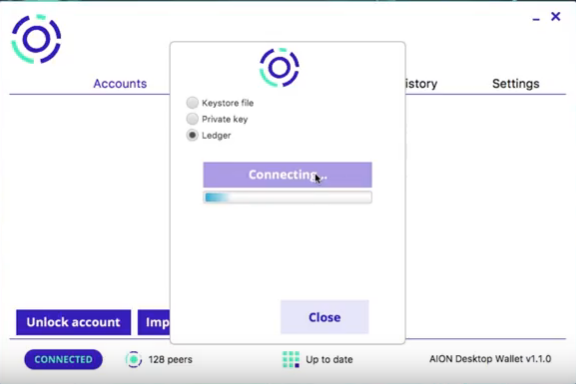 Within in the Aion App on your Ledger, the contract data needs to be set to on. This can be found in the wallet settings. Once you are connected to the Ledger Device, you will want to grab your new Aion (MainNet) Coin public address. Now that you’ve got everything setup, you can follow along with the video. Here’s the tricky bit. We recommend transferring a small amount of AION ERC-20 tokens as a first run-through. 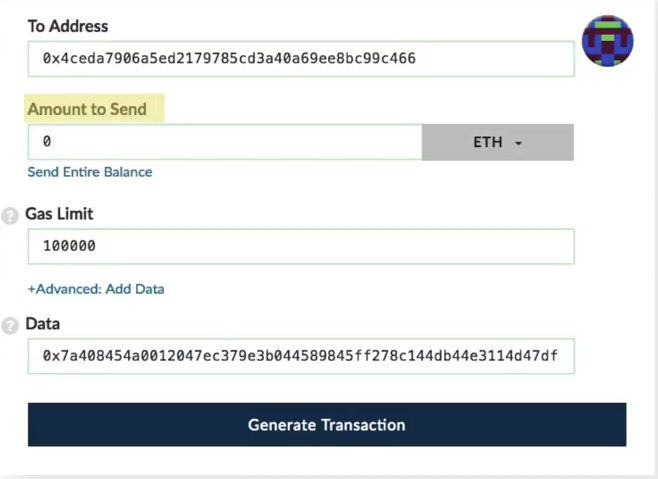 In our video example, we are only transferring one AION ERC-20 token that was stored in the Ethereum Wallet on a Ledger Nano S Device. When you are directed to the MyEtherWallet or MyCrypto transaction page there’s an ETH field that needs to remain at 0 ETH. The operation we want to perform is a contract interaction, not a transaction to the contract. The bridge website generates additional data that is included to make a contract interaction with Aion Network’s ERC-20 contract on the Ethereum Blockchain. If you make this mistake, you will be sending your AION ERC-20 tokens to the Aion ERC-20 contract and may lose your tokens. Please email support@aion.network if you make this mistake. Please refer to the Aion blog for the latest details on the swap, including participating exchanges and wallets. For other support questions please email support@aion.network and provide a detailed description of your issue and include your public address and/or transaction hash as well as any screenshots so we can help troubleshoot. 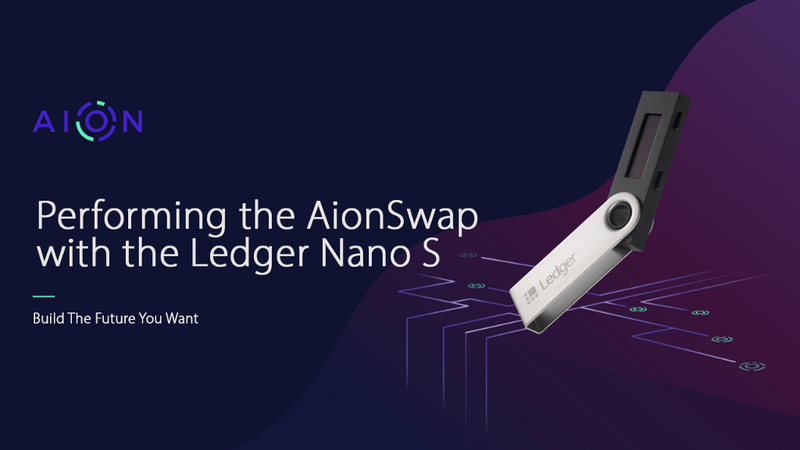 Performing the Swap with the Ledger Nano S Hardware Wallet was originally published in Aion | Blog on Medium, where people are continuing the conversation by highlighting and responding to this story. Next story AIWA Beta Release — a browser-based wallet for AION Coins.